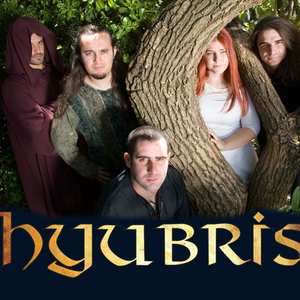 From 2001 onwards, Hyubris started to play continuously, without any hiatus. The name ?Hyubris' derives from the Greek word 'Hybris', which means 'Challenge to the Gods'. Hyubris soon caught the attention and recognition of the public, thanks to their original sound. Basically their music contains elements from rock/metal music, however sometimes it also includes influences from other styles, like progressive-, Celtic-/medieval- or even Portuguese popular music. Before the end of 2002, Hyubris recorded their demo CD called 'Desafio' (which means 'Challenge'). Desafio presented four songs of the many they had written that far. In 2005 they released their self-titled album ?Hyubris'. All of the 12 songs were recorded in Portugal (Oporto) in the studio ?Rec' N' Roll', and mastered by Tommy Newton at ?Area 51 Recording Studios', Germany.